Situated well back from the street. The Barnacle Inn has a large front patio, overhanging front and back porches, as well as a beautiful courtyard which is the perfect place for family gatherings or wedding groups. The Inn consists of 2 floors of 15 rooms and it can hold 26 guests in various configurations of adjoining or private rooms. Guests can mingle, gather and enjoy a signature continental breakfast in the front and the side patio, or have cheese and a bottle of wine at a candle lit table under a summer moon in the beautiful garden area. A wedding day is full of special moments which will be remembered by everyone. 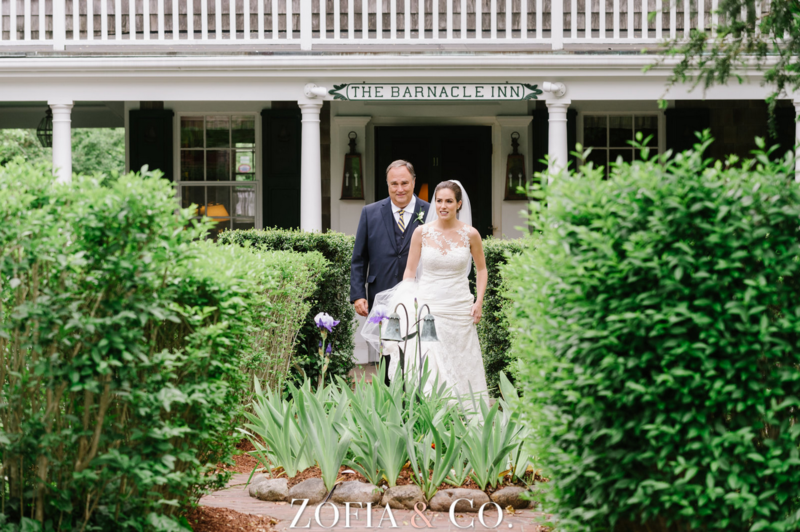 Having handled many wedding groups over the years and with out close proximity to all the island churches, The Barnacle Inn is a perfect choice for bridal parties. Our three bedroom suite is a favorite for brides in particular as it affords a quiet and idyllic setting before walking across the street for the ceremony. Having the entire inn to yourselves makes it a much more memorable experience for all of your guests. There is usually a three-night minimum for stays including a Friday or Saturday and a two-night minimum for weekdays. Booking options are to either book all of the rooms for the length of stay or to create a room block where we hold rooms until a certain date and the guests can call in and book themselves. Price will vary depending on the time of the season but if after deciding that The Barnacle Inn is the ideal setup for your event we can follow up with a quote for the rental. Once confirmed with a minimal deposit, we do require a 50% payment.